"Mummy, when other boys were playing with their lego, Albert was reading a book." 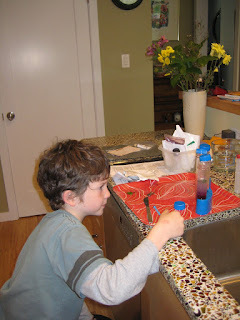 Fin loves to do 'experiments'. Sometimes he uses his chemistry set which requires adult supervision, and sometimes he creates his own experiments in secret, often in the garden. You know about these when you find a plastic pot containing a foul smelling concoction and a small label instructing you not to touch. 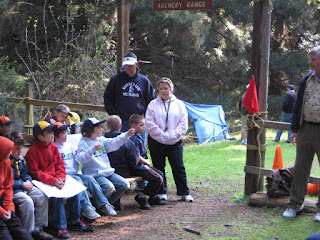 This weekend we took the boys to a scout family day camp. We signed up for a morning of archery. The camp is located among the redwoods in the Santa Cruz mountains. Its was a lovely, if cold, spot. 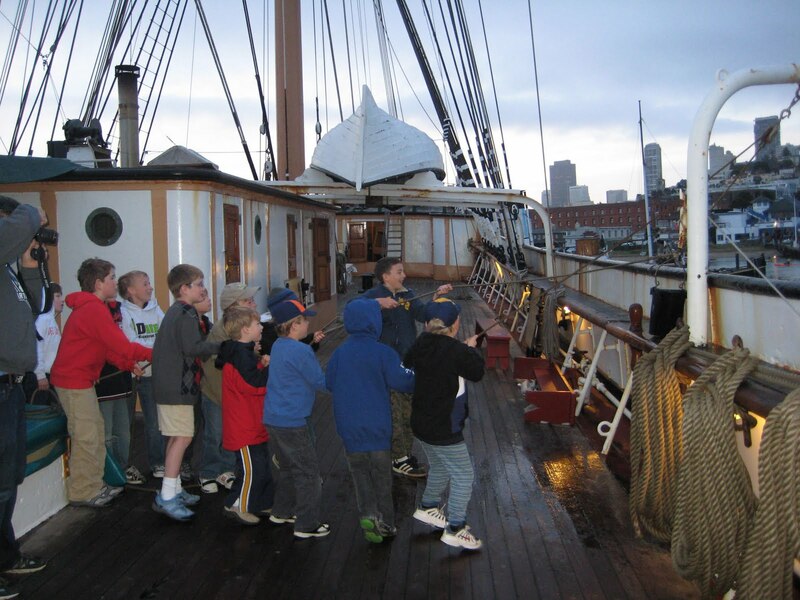 The day started with a safety briefing and instruction on the parts of the bow and arrow, with a quiz to make sure everyone understood. 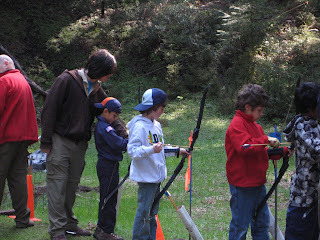 Finally the boys got their hands on the bows and were able to try archery. 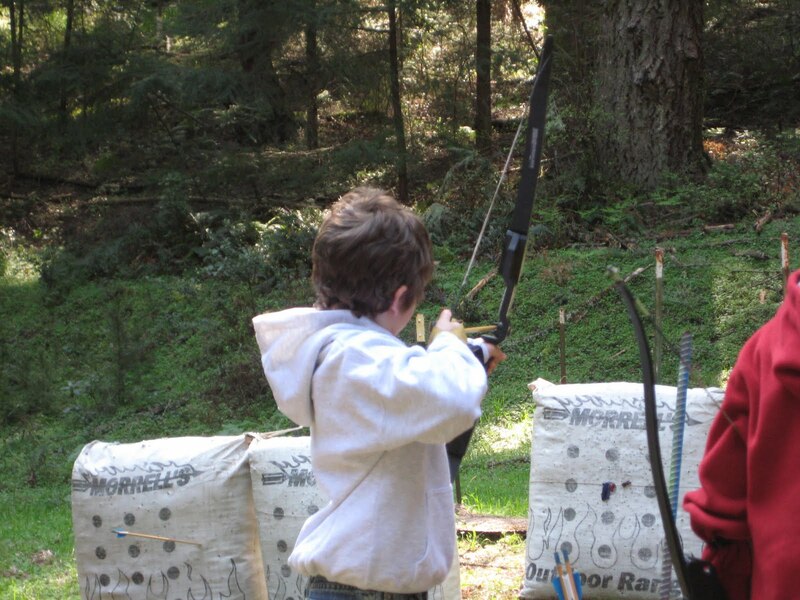 It was harder than they expected - they both found it difficult to pull back the bow string far enough. However after some practice they both managed shots on target. 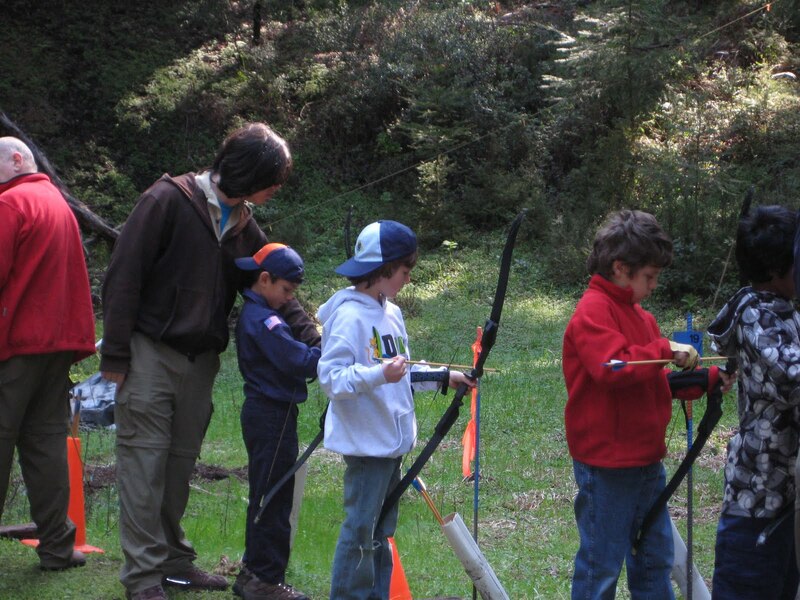 This qualifies them both for an Archery belt loop (cub scout badge). After lunch we stopped off for long-overdue haircuts - which accounts for the short hair in the next pictures! Finlay has cooked dinner for us several times with some assistance and really seems to enjoy it. We decided he could have a go at his Nutrition belt loop which requires the cub to explain the components of a healthy meal, and then prepare one. 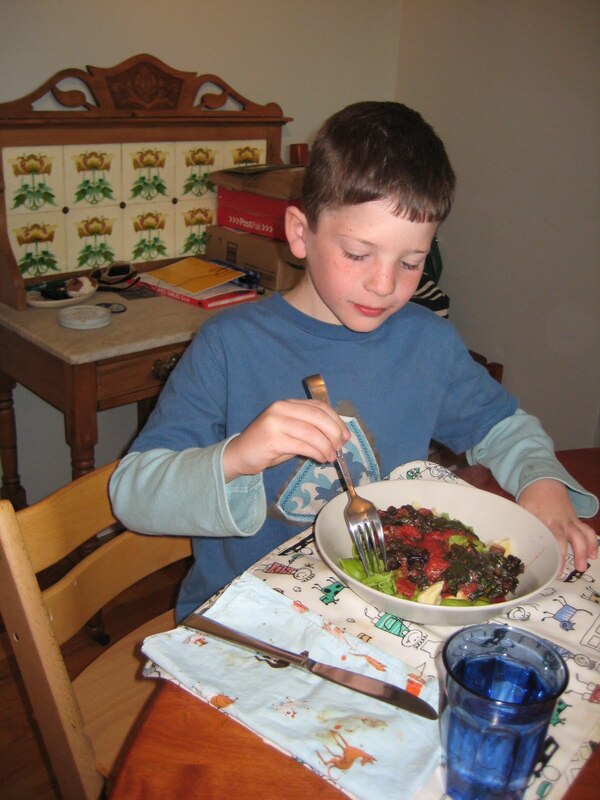 We reviewed the contents of the veg box and decided on pasta with garlic, tomatoes, and red chard. Fin did all the veg preparation and then the cooking. 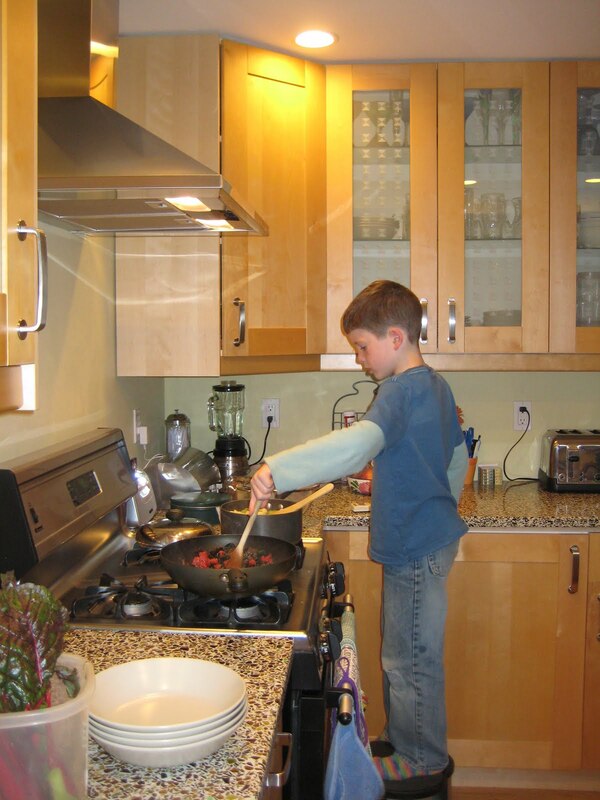 (I set the table as he pointed out that when I cook - he sets the table). 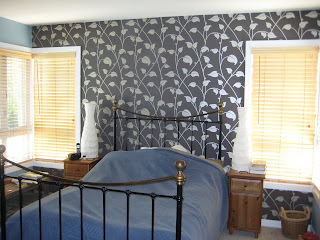 We always planned to have a 'feature wall' of wallpaper in our bedroom. So we didn't have the wall textured, although we painted it in the short-term. I like the paper; the colour goes well with the walls and carpet; and it's exactly what I ordered. However I'm not sure I like the effect in the room: previously our room was calm and plain, and now it's rather busy. Hmm, well I guess it's going to stay there a while now I went to the effort of putting it up, but I'm wondering whether a less bold paper, or a less dramatic colour would have worked better. I'm using yarn that my brother, Duncan, sent for Christmas: its Garnstudio Silke-Tweed in a lovely wine colour. Drops has good pattern support for this yarn - but this sweater jumped out at me and I thought it was a good combination with the yarn. Nothing too fancy so the tweedy effect of the yarn shows off best. 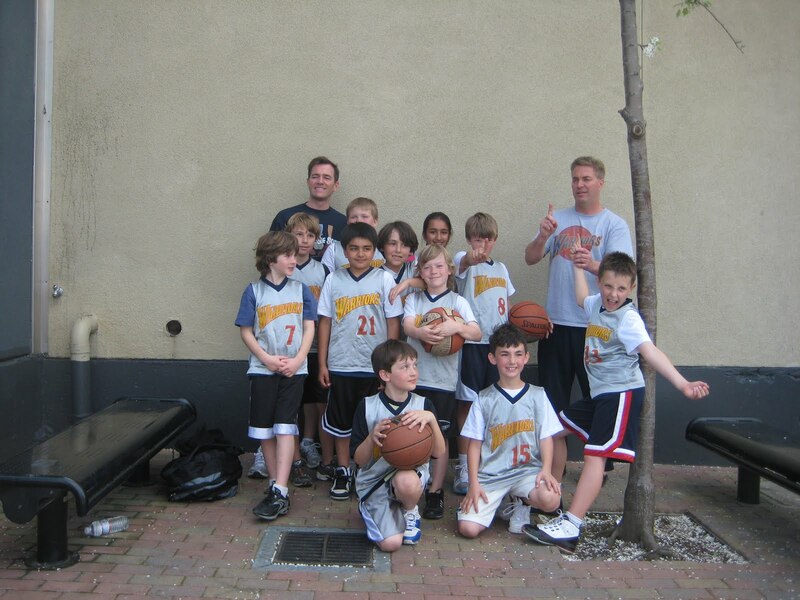 Adam's basketball team won the local district basketball tournament at the weekend. Adam actually scored a point in each of the 3 games during the head-to-head shots - he was delighted! 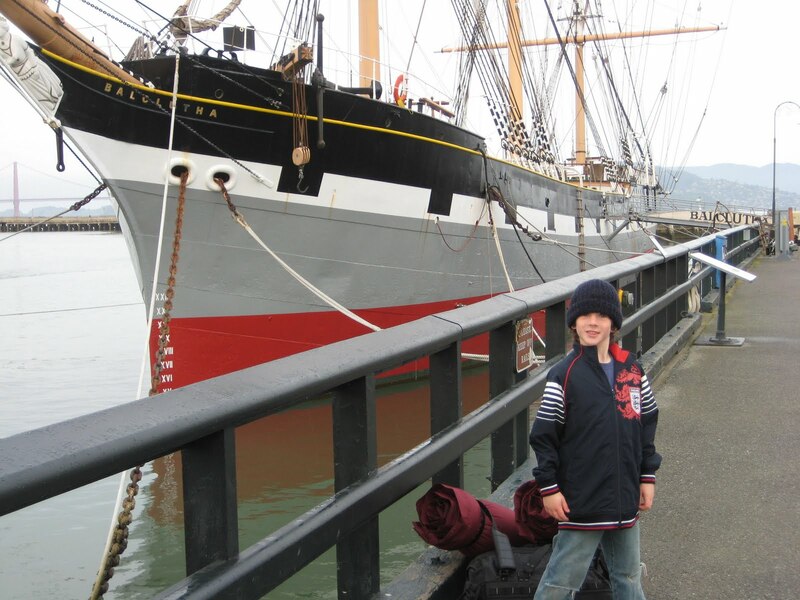 Last weekend Nigel and Adam had an adventure with the cubs: they went to an overnight camp at the Balcutha, moored in the Maritime Museum in San Francisco Harbour. 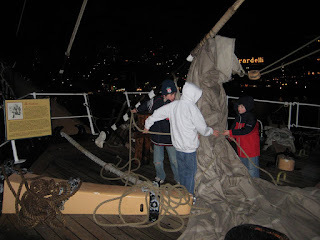 They checked in at 7pm and were put to work raising sails, hauling water, swabbing decks and so on. (Nigel was pleased that only the cubs had to do all this work - the accompanying parents just had to look on). Fin and I joined them in San Francisco and spent the night at the Argonaut hotel which turned out to be an inspired move. Nigel and Adam joined us for breakfast (and a much-needed shower) when they left the boat at 8am. 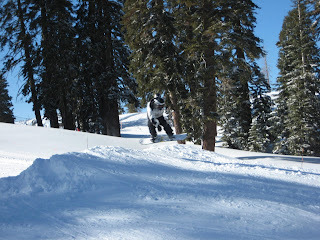 We spent last weekend in Bear Valley. It poured all the way there on Friday - which was not fun to drive in - but meant we had about 1' of new snow on Saturday. It was surprisingly cold but clear and sunny. 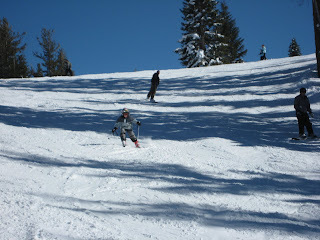 Adam was delighted that Nigel also brought out his board instead of skiing this time. 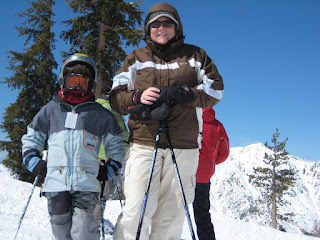 While they were boarding Fin and I went off to ski together. 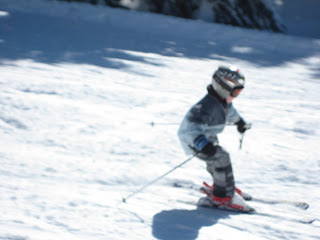 He managed surprisingly well and insisted that when he gets to the winter olympics moguls might be his sport (!). Work is progressing outside as well as inside. 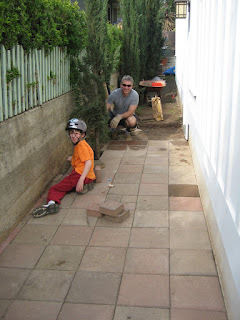 We decided to save money by re-laying the pavers that formed our old back patio to make the new side path. 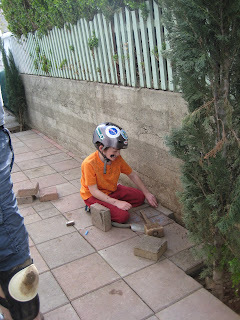 The pavers are set on sand, not concreted in, to give good drainage down the side. We previously had the patio on sand which worked out really well, and made it easier to re-use the pavers. I am seriously hoping that this is the last time that these pavers are laid...it's the third time they have been used so let's hope that the third time is lucky! 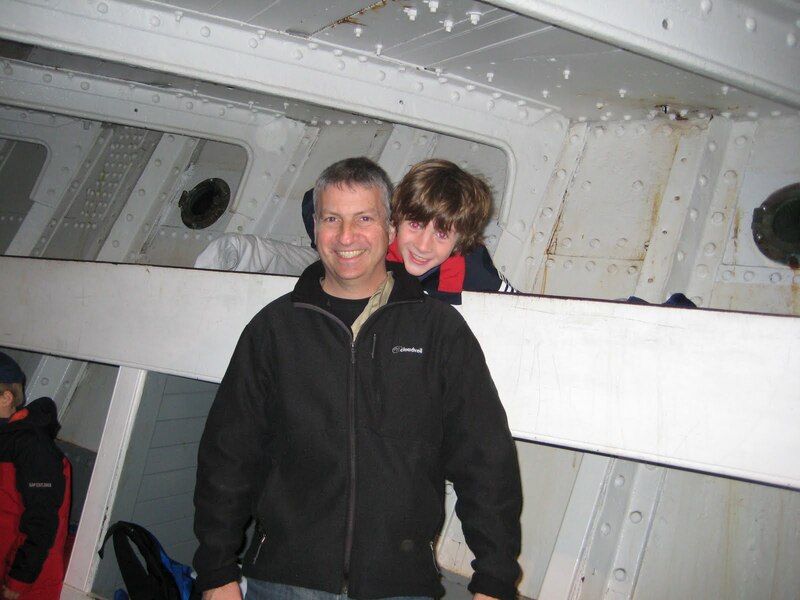 Nigel has been working on this with help from Fin. If you look closely you can see that not only is he working in his bike helmet, but he also has a good application of camo face paint thanks to a Christmas present from his uncle!! 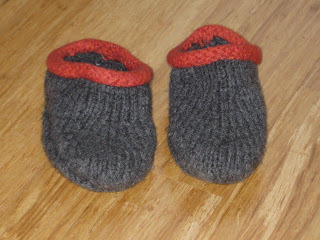 I have actually been doing some knitting: These slippers for Adam use the felted clog pattern knitted in Cascade 220 left over from other projects. I bought suede slipper bottoms for these which work better than the puffy paint I used on the previous pair. 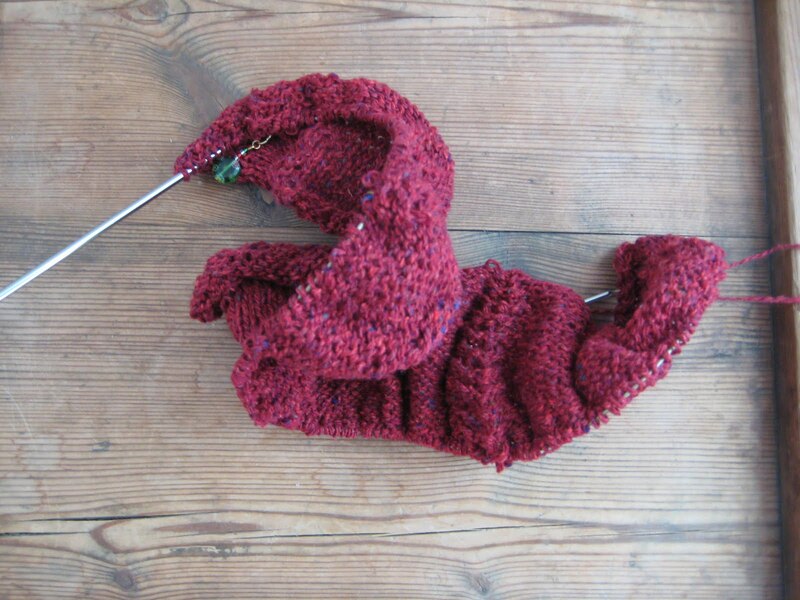 Now I think I need to knit some slippers for myself. These mittens were knitted for a colleague who helped me with my big project last week. 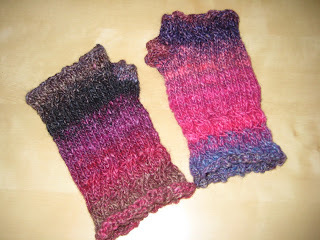 They are knitted out of Noro Silk Garden out of my stash and are the Fetching mitts. Karen lives in Chicago so hopefully will still get some wear out of them this year! 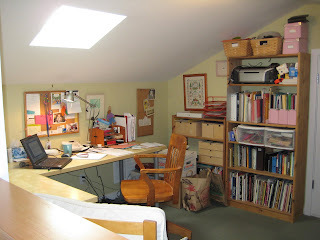 The layout is more-or-less office on one side (shown below) and crafts on the other side! This photo is taken from my desk looking along the 'gallery'. 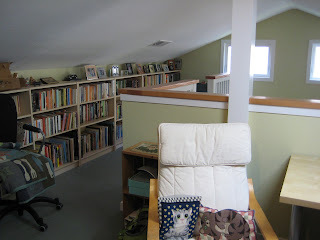 Almost all our books are here - in six IKEA 'billy' bookcases - but they are still double stacked on most of the shelves... and this is after my big book clearout. I went to the library again when I saw how little space we have for additional books. Finally - we had the ladder installed this week. It will have rails on both sides but I'm having those made to measure by a local steel welder. 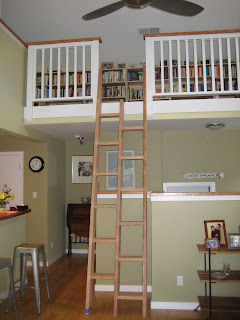 This is an alternating tread ladder which gives a ladder with a gentler rise for the same angle (ie it feels like a ladder that would extend 2x as long into the room in a traditional format). It takes some getting used to - but it's not a ladder that will be in general use. The boys still think I should have a fireman's pole! *The boys, however, love to get into my office and ransack my office supplies!